Be on the lookout, pothole season is upon us. If you haven't noticed yet, pothole season is definitely upon us! If you haven't hit one, you may before too long. We have had several folks come into the shop with tires and wheels damaged so badly they had to be replaced. If you are unlucky enough to bang into one of these bad boys -- and you always know if you do, make sure you get things looked over by your shop to be sure nothing is damaged. If you hit a pothole that's deep enough to damage a wheel, you could possibly damage other components of the suspension, as well. Sometimes an alignment is all it will take to get you back in shape and back on the road. We will also need to be just as careful in parking lots because many of them are disintegrating before our eyes. My shop in Crystal Lake was a victim of this before we resurfaced it. The parking lot started to show problems with the first thaw and proceeded to crumble as the weather continues to warm up. The other thing to be watchful for are potholes filled with water, which can mask how big and deep they are. What might look like a small puddle in the road could be a very deep hole that can do great harm to your vehicle. I also recommend leaving some extra room between you and the car in front of you so you have time to respond if that driver has to make a sudden, evasive move. Sometimes the best thing to do is straddle the pothole, but if you are following too close you won't have time to make the right decision. You could end up right in it! 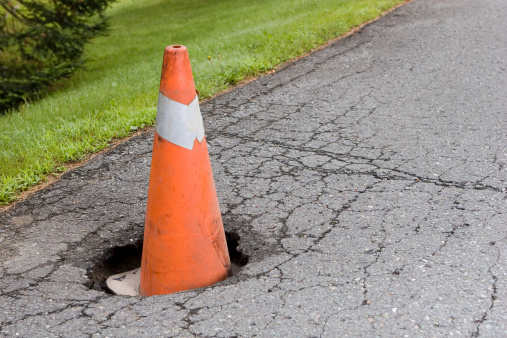 Be careful out there and we will be through this pothole epidemic soon -- just in time for road construction season!